As we left off on in the previous issue, Hush had Stephanie Brown, Spoiler, cornered in an alley, and was about to bring the curtain down on her one-woman show. She at least attempts to fight him here, but she's not used to actual fisticuffs, and Tommy prefers gunplay. But fortunately, and predictably, Batman comes in just in time to save her. 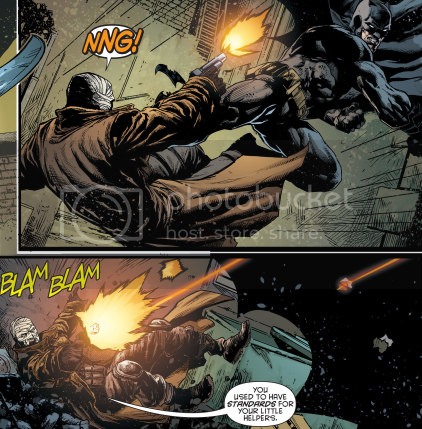 It's good that even though Batman is clearly the dominate fighter in this scrap, Spoiler still manages to slam her bike into him, and after Hush's grenade goes off, pulls a disappearing act that leaves Batman of all people impressed. Not bad, kid. "So that's what that feels like... repeating a line from a movie about me, that is." With Batwing rescued and Alfred reunited with Julia and off to rest, Batman's back to work trying to figure out what Hush is up to. But what he's up to apparently still involves everybody's least favorite turncoat, Jason Bard. Apparently no less a jerk for having almost died at the hands of Babs and Red Hood, Bard continues to plot and scheme with our bandaged baddie to ensure Batman loses access to all support. To do this, he has given our wormy Commish the locations of all of Batman's private Bat bunkers throughout the city to leak to the press. And of course, that's just one step of Hush's plan. "So, uh... can I get in on that hug, or...?" Bruce had become so busy with the gang war, Architect, Arkham's collapse, and fighting Hush off wherever he could find him, he hasn't been back to the cave in a long time. 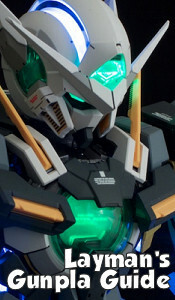 And thus he'd forgotten to check what it is that Hush did when he broke in aside from drugging Alfred. Now that Hush has DNA and a knowledge of the locations of the Bat bunkers, he has unlimited access to their contents, and uses it to cause an explosion that kills patrolling soldiers. This is not going to go well for Batman's public relations. But then, nothing ever does, no matter how hard he tries. 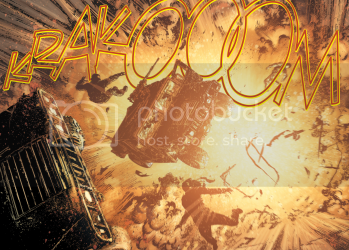 Take a note, kids: KRAKOOM is the sound of Batman bunkers exploding, killing members of the National Guard. 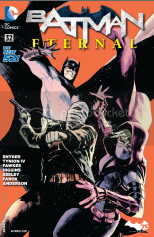 The series is certainly pulling its weight the past couple of issues, now that that whole Arkham bit is over. I'm especially enjoying this issue's art from Jason Fabok. He's doing the next issue, too, which pleases me.